She had given up and decided to be the best obese person she could be! She had lost and gained 100 pounds twice and headed back to 310. Karena dug in and stayed at 265 for five years living on 1500 calories, exercising four times a week only losing AND gaining 10 pounds over five years. She was in pain daily from fibromyalgia, arthritis, a reversed shoulder replacement and a damaged knee they wanted to replace. She noticed an 80 year old colleague losing weight in 2011 and thought, "Hmm, she can't be busting it at the gym, what is she doing?" An Amazing program! Two years later, 120 pounds smaller, with all pain gone, all health markers absolutely great AND, "No knee replacement in my future!" She gets in 10,000 steps almost every day, takes the stairs, dances, sleeps better, and her mind is quiet and at peace. 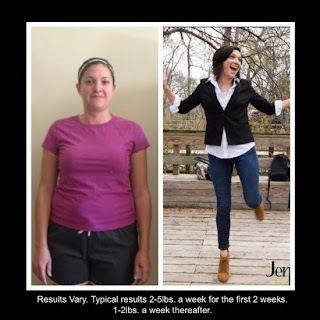 She feels like this program saved her life. Skip the Excuses and self-pity!!! Meet Craig. 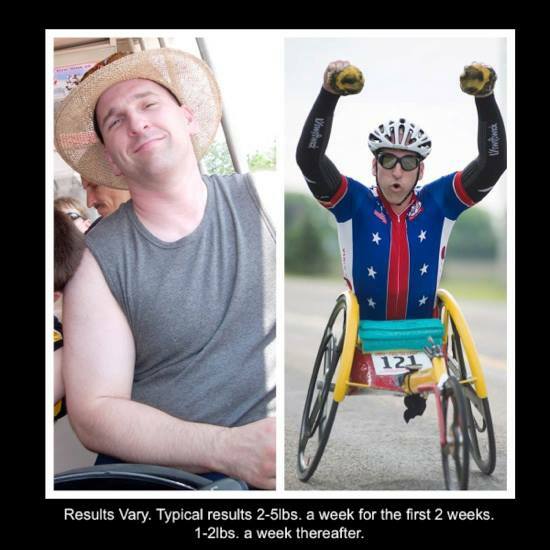 He is a shining example of achieving goals, pursuing ultra health, and not letting excuses stand in his way. Nothing stops him! He now has freedom to move however he wants to! Through his journey he has learned it's not about solving a problem-but focusing on CREATING a solution for his health. Choosing between what he wants now and what he wants MOST! "I am learning to change the wording in my head from I can't to how CAN !!! By having the help of a Certified Health Coach, Dr. A's Habits of Health System and the simple "training wheels" approach to healthy eating, a mental shift occurred ...and his weight problem took care of itself! If you're trying to solve a problem of being overweight-think about Craig's example instead. 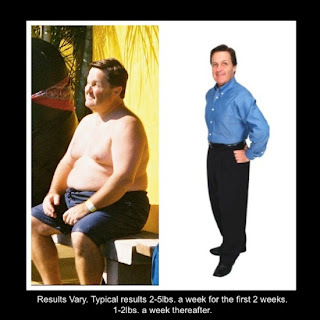 FOCUS on CREATING health with a comprehensive proven and effective program! Can't wait to hear what you want to CREATE in your life today!! Monday's Note to Celebrate the Victories! I'm looking forward to hearing from you sometime today or tomorrow ... I love celebrating all the tiny steps that you and I are taking to improve our health!! Connect in someway, let me know the score and send me a new photo! Greg and I traveled to Dallas, TX, this past week ... we took Medifast meals with us and were so grateful for the convenience, nutritional confidence, reduced meal expenditure, and decreased temptation to indulge!!! Having our meals with us meant we were able to make wise choices consistently, enjoy the lovely meals we did chose to have in restaurants, and come home without "extra baggage!" Click Here to Read More. Last week's note had lots of info on upcoming events, you can access it by Clicking Here. I'd love to see you here at our home on a Thursday evening for our Health Coach and/or client Intro get-together. And, I'd love to get you an invitation to one of the two Health Coach Training events in September ... if you can't attend or don't live close by, so much information is available on line! Check it out here then let me know what you watch and let's make a date to chat about it. This week, take a look at "Active Living: Inside and Out" in chapter 13 of Dr A's Habits of Health ... What movement, activities, and exercise are you adding to your routine? Knowing that being active consistently gives us the best results, how are you adjusting your environment to support your new activity? I got a little hungry and still had 40 mins before my next meal, so I got up from my office chair and danced around (where no one could see me!) singing, "Go girl, Go girl, Go get the fat!" I feel so much better! I also had a drink of water, had some celery and prepped my next meal! This is great! I'm back on to burn through the five pounds I've gained over the summer holidays ... This is day 4 and I'm down 4 1/2 pounds! OH Goodness, I love this program!!!" PS, Results NOT Typical! I'm having some challenges with remembering to eat every three hours because I'm not used to that. At first I was watching the clock for my three hours to arrive because I was hungry. Now I'm just not feeling hungry which is a miracle in itself and so I have to be vigilant to "fuel." I'm loving the structure of the program and it feels very doable. My husband and friends say that they can tell by my face that I've lost weight. My clothes feel a little loser and I feel very hopeful - that's the greatest reward for me right now - to feel hope that I really can lose weight but also be able to keep it off. Thanks for your part in that! This week's story: Russ has a wonderful Story ... "Having spent 35 years in the restaurant food industry from dishwasher to Vice President, I’ve seen it all." Click Here!! Have a GREAT week! I can't wait to hear from you and THANKYOU for the referrals!!! 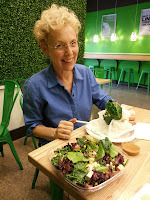 My wrap, Greg's salad were huge! Greg and I traveled to Dallas, TX, this past week ... we took our Medifast meals with us and were so grateful for the convenience, nutritional confidence, reduced meal expenditure, and decreased temptation to indulge!!! Having meals with us meant we were able to make wise choices consistently, enjoy the lovely meals we chose to have in restaurants, and come home without "extra baggage!" I'd love to hear what works for you! Share your secrets to success. Don't go hungry, having a shake an hour or so before leaving home means that I'm not in the "I'm Staving NOW!" mode. Shop the menu before going into the restaurant. Request that the typical bread or chips be taken off the table or not brought out in the first place. Salads with vegges and protein usually work if we "hold the bacon, tortilla chips & nuts for now"
Broiled fish, chicken. or tofu work if not breaded. Some broth based veggie soups are doable. I ask the waiter what side vegges are being served and, if appropriate, I ask them to substitute a veggie for the potato, rice, or noodles. I've been known to ask for an extra salad to munch on while everyone else has an appetizer. I always request dressings and sauces be served on the side or skipped. Request a "To-Go" box arrive with the meal so I can put half the meal into it for later. Sometimes we share an order. Drinks present another issue ... seltzer water with lemon, no-cal sodas can be helpful ... is this an issue for you? Drinking alcohol can through your efforts and resolve right out the window! What's your next adventure??? Thank you for letting us be part of it! 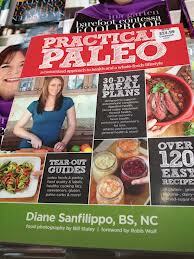 This is a great TED Talk on "DeBunking the Paleo Diet" ... Very interesting! Monday's Note ... Why did the elephants get kicked out of the pool? Happy Monday ... My favorite day! I love hearing from you and getting the update on your health journey! I jot down the results you share and celebrate the incremental, weekly victories, flashes of insight and life changing health improvements. I also get to help out with challenges and dilemmas, sort out orders and schedules, plans and dreams. Find out why the elephants got kicked out of the pool at the end of this note! Recently, a client texted me, "I want this to happen faster!" Oh course! We all do ... and I don't know why the weight loss and changes happen more quickly for some than others ... I do know for sure that it's the steady determination, the tiny, daily habits, that bring about the lasting change! And, sustainable change, sustainable health is what we are all after! Our team has a secret client FaceBook page, Healthier Habits 4u Client Support. Just send a "Friend Request" and you can Friend Request me too at My personal page. Many clients love the opportunity to track their progress and connect on MyTSFL.com. The new TSFL Food Journal is a great tool. I've attached it because I've found it to be very helpful. You can add it to your order for a dollar. The First Annual Discover Your Optimal Health Day!!!! Sept 12th ... we will be celebrating with others across the nation and will have more details soon! Healthy Happy Hour! 7pm on every Thursday evening, call for directions. The Rewards of Health Coaching, 6pm Thursday evenings, call for invitation and directions. Portland/Vancouver Area Health Coach Training with TimCox (Lucky us!!!) on Saturday, Sept 7th, from 9-noon at the Heathman in Vancouver, WA. Introduction to Health Coaching Webinars - Click Here to check them out! And, there's Coach Training available online too ... it's live on Monday and Thursday evenings. Best of all, an entire library of Opportunity and Coach Training Webinars are available to us all. Click Here to check them out. Please share this information with anyone that has a heart for helping people and who is looking either for an additional tool to add to their "Tool Kit," or who is interested in starting a business and wants information ... I'll be happy to interview anyone you suggest to see if they are a good fit for our team! Finally, who's noticing and who's ready to get started????? I'm surprised over and over again at the stories and changes, determination and reclaimed health that I get to be a part of ... this is too wonderful to keep to ourselves. 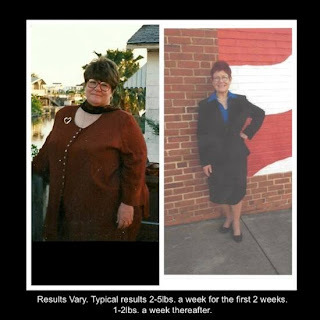 Click Here to read Brandie's story ... this is what I get to do all day long!!! Just so you know, YOUR story is really my favorite!!! And Why did the elephants get kicked out of the pool? They've been using the our program successfully and keep dropping their trunks!" I can't wait to hear from you!! !